Measuring patient satisfaction and quality of care has become a much talked about topic lately. Due to changes in federal law, Medicare reimbursements paid to hospitals are now tied to patient satisfaction scores. These new laws give hospitals even more incentive to improve patient satisfaction and experience – which, in theory, is a good thing. Doctors (and hospitals) should be subject to feedback and held accountable for their work. There are, however, problems with patient satisfaction surveys. Dr. Christopher Johnson writes in a recent article that patient satisfaction surveys – as currently used – are “riddled with problems.” Dr. Johnson goes on to say, “they [surveys] don’t measure what they are suppose to measure and they can easily drive physician behavior the wrong way.” Dr. Johnson refers to his survey tools as made and facilitated by Press Ganey. Press Ganey is a massive corporation that provides hospitals and health systems full service patient experience solutions, in which Press Ganey writes, distributes, and collects the surveys and data. As such, hospitals using Press Ganey’s services essentially outsource all of their patient satisfaction and survey measurement. Dr. Johnson writes, “I’ve read the Press Ganey forms and the questions they ask are all very reasonable.” This quote raises a red flag that perhaps Dr. Johnson misses: Dr. Johnson is not, nor is anyone at his organization, writing the questions on their patient satisfaction surveys. It makes the most sense for those who are trying to benefit from collecting their own patients’ data to write their own surveys. Those closest to the patients and those working in the hospital are better suited to understand the different context and circumstances surrounding the measurement of patient satisfaction. Instead of a Press Ganey employee 800 miles away writing survey questions and processing the data; the doctors, nurses, and administrators should be more involved in the process of measuring quality of care. There is no such thing as a one-size-fits-all survey. Dr. Johnson also speaks of the poor sample sizes used to collect the data; “[a]lthough the forms are sent out to a random sample of patients, a very non-random distribution of them are returned. Perhaps only the patients who are happy, or those who are unhappy, send them back.” This very well could be true, but it is most likely an easy fix. Again, each hospital knows (or should know) the best way to collect data from their patients. Generally, for most hospitals, the best way is with in-person paper surveys. Surveying the patient while still on site raises response rates and ensures that the sample size is more random than the one Dr. Johnson describes. Along with higher response rates, a patient’s memory of her experience is fresher when surveyed on-site and therefore the data is more accurate. Dr. Johnson is correct in saying that patient satisfaction surveys “as currently used are riddled with problems,” but there are solutions to these problems. Understanding the quality of care provided by a doctor or a hospital or a nurse is too important to ignore or be discouraged by those obstacles. The healthcare world has been talking about measuring patient satisfaction for decades yet still have a long way to go. Getting rid of patient satisfaction surveys is not the solution. Acknowledging constructive criticism about the process and fostering open debate about improving patient satisfaction is the solution. A recent article on Forbes.com asked an interesting question: is patient satisfaction overrated? The question is an important one and warrants more discussion. The article (found here) uses Dr. House, the rude but extremely effective fictional doctor from the Fox television series “House,” to analogize that perhaps patient satisfaction doesn’t always equal quality health care. The author – Steven Salzberg – attempts to make the point that while Dr. House is abrasive and his patients do not have the best experience, they do receive the best care. Salzberg writes that even though large scale reforms in healthcare are pushing the importance of patient satisfaction, better patient satisfaction scores are not necessarily correlated with better care. Essentially, instead of giving patients what they want, doctors should give them what they need. Salzberg doesn’t just use the “House” analogy; he cites a study that shows higher patient satisfaction rates being tied to higher costs and higher death rates. AutoData agrees with some of the author’s points and disagrees with others. AutoData couldn’t agree more with the premise that doctors must give their patients what they need as opposed to simply what they want. And we are not disputing the study Salzberg cites (though we’re unsure of the context and specifics of the study). However, Salzberg asserts that measuring patient satisfaction in general is the overall problem; AutoData believes the problem is in how patient satisfaction is measured. “For patients who think a nice doctor is a good doctor, this might come as very disappointing news,” writes Salzberg. If surveys are asking patients questions like, “Was your doctor nice?” or “Did they communicate well with you?” or “Did you have a nice time?”, of course these metrics are hollow and should not be correlated with better care. But that doesn’t mean patient satisfaction doesn’t work, it means the provider of care must change how and what to measure. In other words, identify the data that will lead to better care and measure for that. Collecting data which shows that the care administered was superior will not always be the same as the data that shows the patient had a good time (AutoData discusses this in a post about the differences between patient experience and patient satisfaction here). Salzberg also touched on the infamous standardized hospital survey, HCAHPS. He writes that Dr. House would fail this survey with flying colors, which is probably true. A one-size-fits-all, nationally standardized survey doesn’t make sense to us either. Hospitals and health clinics operate under different circumstances and contexts serving different demographics; measuring them against each other under one standardized survey is asinine. Hospitals have different objectives, goals, and ideas about delivering quality care, so why limit the ways they measure satisfaction and experience? Let the hospitals be in charge of the data they collect, ultimately it will lead to their success or their demise. The most encouraging trend AutoData has seen over the last 4 years is the consumeraztion of health care (AutoData wrote about it here). Due to advances in technology and the internet, healthcare consumers have been given a more powerful voice and as a consequence will continue to have more choices in care providers, ultimately forcing health systems to provide higher quality care. Therefore, it’s arguably more important than ever for health systems to measure patient satisfaction and experience. If the health system effectively listens to their patients through patient experience measurements, they can improve their service, advertise their superior service, and ultimately grow. Salzberg’s article narrowly misses the point. It isn’t that patient satisfaction is overrated or unnecessary, but health systems must adapt to measure and collect the right kind of data. The right kind of data is data that will improve their care, not data that assesses whether a doctor is nice. When the right kind of data is measured and collected they can use it to persuade potential consumers to choose them as their provider of care. In that case, measuring the right kind of patient satisfaction is grossly underrated. Is there a difference between patient satisfaction and patient experience? If so, how should both be measured? The quotes provoke a few interesting thoughts. The obvious one is that patient satisfaction and experience have never been more important. Yet, another thought begs the question: is there a difference between patient satisfaction and patient experience? Although closely related, there are certainly a few nuances differentiating the two. In order for a hospital to take incremental improvement and turn it into transformational change, they must understand the difference between patient satisfaction and patient experience. Perhaps more importantly, they must understand the difference in measuring the two. In the end, greater patient experience will translate into greater patient satisfaction which in turn will lead to a higher HCAHPS score. There are currently 735,000 men and women residing in assisted living housing in America. Over the next 20 years, as baby boomers continue to age and leave the workforce in droves, the number of assisted living residents will spike. Recent questions surrounding patient safety and the quality of care administered at these facilities have been raised in the media, most recently highlighted by an investigative series done by PBS’s Frontline. A large concern surrounding the problem of patient safety at these facilities is “ too often, families don’t have the information they need to protect their loved ones residing in assisted living facilities,” says National Association of Professional Geriatric Care Managers’ President, Julie Gray. One of the best ways for facilities to get that information into the hands of those families is through measuring their own quality of care and resident satisfaction. The best way to measure care and patient satisfaction is by surveying residents, employees, and families. Pioneer Network – a non-profit organization which advocates for positive change in eldercare – released a helpful guide outlining what families should look for when searching for the right assisted living facility. The guide is not only extremely helpful to families looking for the right facility, but it is also helpful for the facilities themselves. It serves as a reminder of the importance of constantly evaluating the care an assisted living facility provides. The guide suggests families ask specific questions about “person-directed care and what the assisted living community is doing, if anything, with person-directed care.” The guide lists specific questions to ask: how do you welcome a new resident? ; do you measure resident satisfaction each year? ; do you provide training for your staff on how to provide person-directed care? ; etc. As obvious as it may seem, care facilities should be asking themselves the same questions about the care they provide. Further, the guide suggests that facilities survey family members of the individual residing at the facility. Assisted living facilities will increase their quality of care and patient satisfaction by asking their residents, employees, families, and themselves, the right questions. The best way to ask and answer the important and specific questions put forth above is through custom tailored surveys. Facilities are in the best position to know which questions to ask. When facilities have the ability to custom tailor their own surveys to ask those specific questions and to freely edit those surveys, they put themselves in a position to gather more accurate and valuable data. 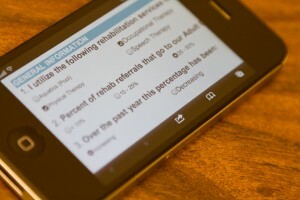 Feel free to contact AutoData to find out how we can help assisted living facilities create custom tailored paper and web surveys to improve your care, and most importantly, improve the overall quality of life for your residents. In a prior post, we briefly explained the differences in creating forms with our two main survey scanning solutions – Scannable Office and ExpertScan. In this post, we will explain the other main difference between the two products: reporting the data. An important reason customers choose to use our software is to clearly understand the data they collect. Whether it’s measuring patient care or customer experience, the data doesn’t mean much if you don’t understand it or if you can’t convey it clearly to others. In general, it’s much easier to convey raw data through visuals (bar graphs, pie charts, line graphs, etc.). This is where ExpertScan comes in handy. ExpertScan has automatic reporting built into the software. When you scan in your form or survey, the software creates a handful of different reports on the data automatically. With the click of a mouse, a window pops up with a question-by-question breakdown and option to view the data in bar graphs, pie charts, trend analysis, etc.. ExpertScan also has tabulation rules that allow you to parse out certain types of data. For example, if you have a patient satisfaction survey which is used in multiple hospitals, ExpertScan’s reporting allows you to see the differences, question-by-question, between those different hospitals or even the different doctors. These reports can be easily converted to PDF files and disseminated to appropriate personnel. Further, all of the raw data scanned into your computer also gets saved in a separate Microsoft Access database. While Scannable Office offers more options in form creation, it does not offer the automatic reporting features that ExpertScan has. With Scannable Office, the data can be uploaded directly to any ODBC compliant database – Microsoft Excel, Microsoft Access, MySQL, Oracle, Filemaker Pro, etc. Once in the database, one’s options to manipulate and report on the data are endless. However, the options are limited to the user’s experience working with any of the aforementioned databases. Customers who come from smaller organizations or have less experience working in ODBC compliant databases love the automatic reporting ExpertScan provides. Customers who work in large institutions sometimes prefer Scannable Office because they have the personnel and resources to do much more analysis with the data in ODBC compliant databases. So there you have it: A brief description on the differences in reporting your data (and previously – from creation). As stated, these are the two most distinct differences between ExpertScan and Scannable Office. But we’d love to chat with you about further nuances between the two! Feel free to contact us directly at any time! There’s no use denying it, tablet use is on the rise. Whether it’s for personal use or business reasons, many of our customers and readers use them (you may even be reading this blog on your tablet). Here at AutoData, we have noticed an increase in the amount of questions from customers regarding a survey solution for tablets and mobile devices. The solution? NetE-nable: the cloud-serviced web add-on to ExpertScan. Tablets are quickly becoming more than just a novelty; they’re gaining popularity among users seeking more portability, ease of use, and simplicity over their current computer experience. Whether you need to catch up on emails, read the latest news in your industry, or take meeting minutes, tablets are proving to be more and more valuable in the business world. With our cloud-serviced web add-on, NetE-nable, AutoData has the solution to gathering data via tablets. 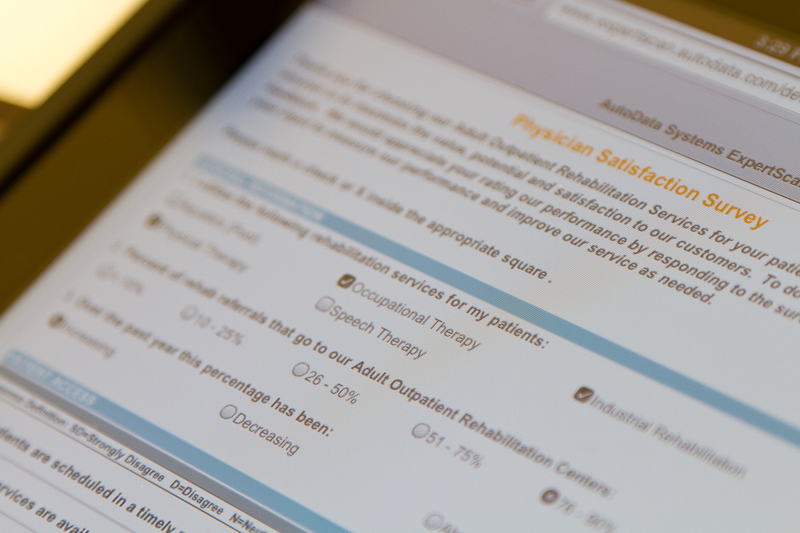 As pictured above, tablets using a NetE-nabled physician satisfaction survey can be filled out and instantly deliver data on tablets with a web browser and an internet connection. Since we here at AutoData still strongly believe that paper surveys will always have a place in data collection, we offer the combination of both paper and web surveys into one database. This is what separates us from the rest. No need to give yourself (or your IT department) more Access/Excel work dealing with having separate databases. AutoData provides you with the all-in-one solution. Have a device with a web browser and internet connection? A NetE-nable survey will work! Try out a sample survey on your device and tell us what you think. Not an ExpertScan user? Request a demo of our software as well as a live, screen sharing demonstration. Watch the Learning Center’s ExpertScan with NetE-nable intro video for another look at our software. Already using ExpertScan? Contact us and request a free, 14-day trial of NetE-nable.